Yes, we offer free shipping via USPS. You have heard of Maeng Da as being the strongest Kratom available today but not sure which one is right for you? Or are you simply looking to buy the Maeng Da Kratom of different varieties and at discount prices? Here we have the Maeng Da Kratom pack for you. It include all the three strains of Maeng Da Kratom (green Maeng Da, white Maeng Da, and red Maeng Da). Each strains is of 1oz and let you save the $10 instantly. Sourced from the deep jungles of Southeast Asia, these Maeng Da Kratom strains produce great mood and energy enhancing effects. We only import highest quality grade and all three Maeng Da strains are available in fresh form. We take a number of steps daily to ensure that you are getting the best Maeng Da Kratom strains for your money. Not willing to buy the Maeng Da Kratom in pack? Don’t worry! 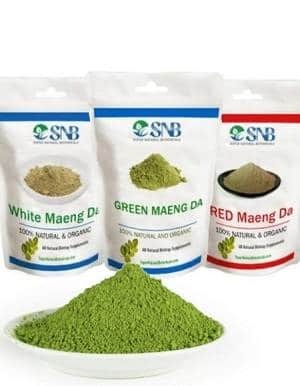 Buy any of these strains separately here: Green Maeng Da Kratom on sale, White Maeng Da Kratom on sale, Red Maeng Da Kratom on sale. Free shipping on all products is our speciality. And we offer money back gaurantee if you are not satisfied with our products. I ordered this pack for a friend who is going through a horrible divorce. The kratom provided him with great relief from his anxiety and allowed him to function. This variety pack allowed him to see which kind was the most effective for him. As a result, I am ordering a pack of the red vein for him. My experience with SNB thus far had been extremely good! The employees are very friendly and eager to help. Anytime when getting on the website, they are always just a click away to answer any questions you many have. Jennifer is so helpful and I hope SNB knows what a jewel they have representing Super Natural Botanicals. Once I receive my product, I will be more than happy to let you all know how it is. Received my package super fast for USPS delivery! I had tried the 3 pack sampler but for whatever reason one of the three was missing. I chatted them up first thing this morning and I have already been credited for the missing pack. Product is exactly as described beyond that. I will be making another order! I received the pack very quickly even though I opted for free USPS delivery. Unfortunately I didn’t receive the Green Maeng Da, but Jennifer responded quickly to my inquiry & I received the credit back without any hassle. The white really energizes me while the red calms me down & at slightly higher doses promotes a gentle feeling of sleepiness & then a good night’s sleep. Definitely recommend! We liked the green the best but were impressed with the energy enhancing and euphoric properties of all three strains.